Mary Grassia has been a part of the Peirce community for 9 years, working in the Registrar's office. But this month she’s added a couple new connections to the Peirce family: She's one of the first graduates of our Master of Science in Organizational Leadership & Management degree program (MSOLM), and she’s the first award recipient of our Patricia A. Rucker Graduate Studies Award for Academic Excellence. We caught up with Mary to talk about her Peirce educational experience and what she’s planning to do with her new degree. Here’s what she told us. Why did you decide to go back to school at Peirce? I’m the first one in my family to earn any kind of college degree, so I wanted to do it for myself and for my family. A master’s degree would let me grow within my career. 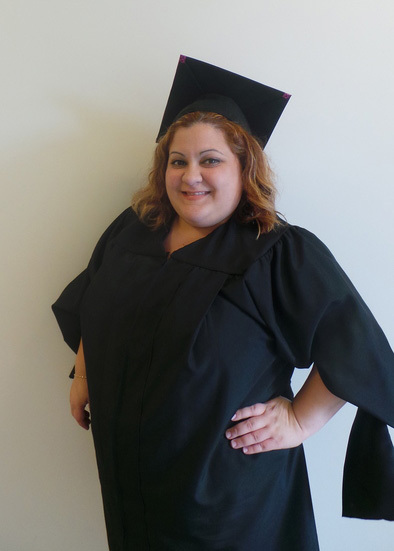 I was looking for a positive educational experience, and I knew from working at Peirce that completing a degree program here would fit with my schedule and my goals. What was your experience like at Peirce in the MSOLM program? I had a great experience. Time management and scheduling were very important. As a working adult, I had to balance school in between work and personal responsibilities. I also was able to get involved in the Graduate Student Association, which was a great forum for learning more leadership skills. How will your degree help you in your career path? My degree program helped me build leadership skills that I can use right now in my professional life. One of the books I read as part of my program was “Working with Emotional Intelligence” by Daniel Goleman. It’s a good example of some of the lessons in professional development that I learned in the MSOLM program—things like how to listen better, give and receive feedback, resolve conflicts, and build stronger relationships in all aspects of your life. What advice would you give to prospective students who are considering pursuing their master’s degree? Breathe. Going back to school can be challenging sometimes, but keep pushing! Earning my master’s degree is something I really wanted for myself, and I committed to it. I’m so glad I did. The whole Graduate Studies team is so supportive. They make it easier. What are your plans now that you’ve earned your master’s degree? I want to keep growing within my career. I’m considering pursuing a Ph.D. And of course, I will be celebrating with my family and friends! Way to go, Mary! We’re proud of your success and thankful for all you do at Peirce!